Mercedes-Benz are leaders in every innovative field of automotive technology. At the same time, they still adhere to those traditional principles which continue to prove their value, despite the inevitable changes brought about by the course of time. This means that all the advanced technology that Mercedes-Benz are pursuing, with a great deal of creativity and financial investment, is subjected to standards of value which have a timeless validity. It is this rather unusual combination of innovation and tradition that results in the special, unique course that Mercedes-Benz follow when developing their cars. "Why don´t they just say that in simple terms?" This, or words to this effect, is what Mercedes drivers and potential Mercedes owners have often said, and written, to us. What they mean is that those basic facts about Mercedes-Benz that are actually essential when forming an opinion, and in deciding whether or not to buy a Mercedes, often get lost in a flood of detailed information. For this reason we are prefacing this brochure with the basic facts about the company and the cars with the three-pointed star, briefly and, we hope, "in simple terms". Progress has no purpose if it does not produce new qualities - at a higher standard of quality. That is exactly what Mercedes-Benz is all about. More safety, even under more difficult conditions. Durable quality, to secure value retention. For instance electronically controlled, long-lasting cavity sealing by means of special wax. Even more effective accident protection systems. Comfort that genuinely reduces stress levels and increases motoring pleasure. Effortless performance, with a high degree of economy and exemplary environmental acceptability. More features to cater for individual tastes. And a range of practical service facilities to eliminate the problems and leave you with just the enjoyment. This is what you are entitled to demand from progress, but only from the sort of progress that is invisibly linked with quality. And if, despite all our efforts, we occasionally still make a mistake, because we are after all human, we will redress that error. Because for us, the quality of progress is more than a mere claim. It is a promise. Mercedes-Benz have been a fundamental driving force in the development of automotive safety. Many of our safety features have become the basis for this legislation, others have been adopted in principle by other manufacturers. It all began exactly 50 years ago with the Mercedes-Benz "Experimental car no. 1", which contained the first specific safety elements. The lead that this gave Mercedes-Benz has always been maintained, right up to the present day. 1951 The first safety bodywork in the world (from 1953 in the MB 180). 1959 The first collision and roll-over tests. Interiors without sharp projections go into series production. 1967 Introduction of the safety steering system. 1978 ABS becomes available for the first time. 1980 The most frequent kind of frontal impact, the offset collision, is taken into account in the design of the car (only by Mercedes). 1981 Electronically controlled driver´s airbag and belt tensioner. 1982 Multi-link independent rear suspension. 1985 Front seat belt tensioners standard in all models. 1986 Electronically controlled automatic traction control systems, ASD, ASR, 4MATIC. 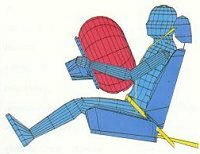 1987 An airbag for the frontseat passenger becomes available for the first time. 1989 Automatic roll-over bar (on the SL). When catalytic converters were still only the subject of lively public debate, Mercedes-Benz took action. The electronically controlled three-way catalytic converter has been available since 1985. In Germany, Mercedes-Benz became the first car manufacturers to fit three-way catalytic converters as standard in all petrol-driven models at the end of 1986. All petrol-driven Mercedes-Benz cars from 1980 onwards can be retrofitted with an open-loop catalytic converter. For Mercedes-Benz, the determining factor was not legal stipulations but the availability of unleaded petrol in sufficient quantity. In respect of gaseous pollutants, Mercedes-Benz diesel cars are today at least as good as catalytic converter petrol-driven models. In particulate emissions, our diesels more than meet the strict limits which already apply in the USA and which are planned for Europe. Since 1949, the proportion of particulates in the exhaust gases of Mercedes-Benz diesel cars has been reduced by more than 85%. In the last 10 years Mercedes-Benz have reduced fuel consumption by 25% (the average for all models). Lower fuel consumption also means lower emissions of carbon dioxide (CO2), which is said to be responsible for the greenhouse effect. Four-valve engines were around decades ago. It is Mercedes who have made real progress with them. By means of electronically controlled, automatic adjustment of the inlet camshaft, these engines now develop powerful torque even at low and medium engine speeds, while unleashing the full 162 kW/220 bhp potential of their six cylinders in the upper speed range. Optimum enginee efficiency is achieved by the fact that the camshaft is rotated by a specific amount so as to arrive at the most effective valve opening times in each engine speed range. The result, smooth-as-silk yet powerful acceleration, from the bottom all the way to the top. Depending on the model and the transmission - five-speed sports gearbox (standard), four-speed automatic or the completely new five-speed automatic (optional extra in the 300 CE-24 and 300 SL-24) - acceleration times from 0 to 100 km/h range from 7.7 to 8.3 seconds. Sufficient reserves of power to provide security for you and for other road users. With, at the same time, considerably reduced specific fuel consumption and further improved exhaust emission characteristics. It is not Mercedes style to promote aggressive road behaviour, but rather to encourage performance driving within the bounds of reason and common sense. The Mercedes-Benz Sportline models conform to this concept. Having already proved exceptionally successful in the 190 series, Sportline versions of the saloons and estate cars in the 200 to 300 series are now available. Sports suspension, lower body, wide tyres, sports seats and in some cases considerably increased performance, make an attractive contribution towards fulfilling the individual wishes of drivers. For us, the best solution is preferable to the second best, as a matter of principle. Luckily, Mercedes drivers see things the same way. Even if this requires more in terms of sophistication and, of necessity, more time and money. But it is the final result that matters, after all. And this result is expressed in features such as the superb multi-link rear suspension; the highly developed ABS; engines with electronic idle-speed control; fuel pre-heating in the diesels; hydraulic valve clearance compensation; extremely hard-wearing single-belt drive for all auxiliaries; height-adjustable seat belts with electronic belt tensioners at the front; electronic temperature control for the interior; heated screenwash system and spray nozzles; driver´s seat also adjustable for height and seat cushion angle; pneumatic headlamp range control; three sun visors; two heated exterior mirrors; adjustable from the inside (nearside mirror electric); automatically closing tailgate on the estate cars; and the automatic belt guide in the coupés. And what does this selection from the list of standard features prove? It merely shows the slightly greater amount of intelligence that goes into the design, with the effect of higher practical value for you. Finding out about all that is possible, but only actually doing that which makes sence. That is the task of our research departments. Exciting innovations which do not solve any problems, or even create new ones, are not what we call progress. Electronics, cybernetics and new materials open up whole new dimensions for automotive and traffic technology. We are hard at work in these areas. Making the outmost use of the exceptional technological potential within the Daimler-Benz group. But we examine closely their real benefits to people and their acceptability to society and the environment. We are working on electric propulsion, hydrogen and solar technology, energy and raw-material-saving technology, and on the development and testing of new materials with made-to-measure characteristics, such as plastics, ceramics, fibre-reinforced carbon and shape-memory materials. With the most modern driving simulator in the world, we examine and test new engineering under conditions close to real life. We are using artifical intelligence so as to reduce or eliminate human error when it comes to recognising traffic situations and reacting correctly and quick enough. "Thinking" suspension and rear-wheel steering, engines with more power yet lower fuel consumption, further reduction of exhaust emissions and the development of recycling techniques are also part of our research programme. You can feel comfortable with Mercedes-Benz. Not just happy with your car, but also with our service and with our people. Your pleasure in your Mercedes should be marred as little as possible by servicing needs or by rare - we are pleased to say - breakdowns or repairs. To achieve this, we offer a meticulously co-ordinated system of warranty and assistance, available to every Mercedes driver. This system includes new car warranty, emergency and out-of-hours servicing, preservation of a customer´s mobility when repairs take a long time, and the unique Mercedes Touring Guarantee which provides assistance and refunds of costs in the case of a breakdown, valid in 22 European countries (for all Mercedes-Benz cars registered as new since September 1989). After a break of over 30 years, Mercedes-Benz are back in the business. The business of competition in innovative ideas, in the demonstration of the highest expertise and efficiency under the toughest of conditions. With eight victories in 1989, the Silver Arrows won the Sports Prototype World Championship for Mercedes-Benz. In this way, a modern challenge has been met in traditional Mercedes fashion. With the right spirit, superior technology and a unique team. Naturally, the Sauber Mercedes car is used for a wide variety of research purposes. The 720-bhp enginge, for instance, is based on the five-litre V8 engine used in the Mercedes-Benz S-class and SL models. 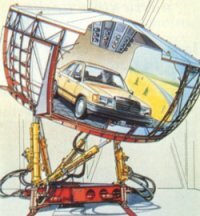 The development of technology which both boosts power and reduces fuel consumption, the testing of new lighweight, high-strength materials and the application of the latest transmission, collation and evaluation systems for vehicle data - all this and many other things will benefit future Mercedes production cars. The T-series models are as individualistic as their drivers. Yet the space they provide, and the flexibility of that space, reflect only one aspect of this particular attitude to cars and to life. Because Mercedes-Benz have combined the practicality of an estate car with the elegance, generous comfort and specific quality of a Mercedes saloon. And this has made the Mercedes T-series the epitome of exclusive versatility. With about 30 new refinements, these successful models are now even more attractive than before. More dynamic outside. More exclusive inside. With significantly enhanced ride comfort and in some cases considerably improved performance. And the T-series range has been enlarged by the addition of a new top model, the 300 TE-24 with innovative four-valve technology, and the new Sportline versions. Which means this range can now provide any desired level of performance, as well as catering for those who like a more sporty flair. The exterior has a more co-ordinated, powerful look. All models have new, distinctive side mouldings. The front and rear aprons, together with the large bumper units, are colour-matched. The exterior mirrors are painted in the same colour as the bodywork and the wheel trims have been redesigned. Integrated stainless-steel strips underscore the elegance of the outstanding shape. Technical improvements have also been made. Optimised gear ratios in all models with five-speed gearboxes (whether standard or optional). To improved smoothness and ride comfort even further, a number of details have been modified in the power train. In addition, all models over two litres now have a new two-mass flywheel, which reduced vibrations, and larger-diameter rear axle shafts. Without taking up any more space on the road or in the car park, the T-series models offer considerably more in the way of usable interior space - in combination with the style of an exclusive saloon. A refined atmosphere and the exclusive comfort are part of the versatility of the T-models. Something you can feel right from the outset. And your enjoyment will increase with every kilometre. Even at higher speeds the careful noise-damping allows you to converse without raising your voice - due in part to the result of the accurate assembly and the high-quality materials and linings throughout the car. The electronically controlled ventilation and heating system can be adjusted separately for the driver and front passenger; it works quickly, quietly and without causing any draughts. And the new features make the comfort even more luxurious. The newly designed seats have better fluting, firmer upholstery and more clearly contoured side sections, so they now offer even greater comfort on long journeys; relaxing support, they feel different. The same applies to the rear seats, with room for three adults. 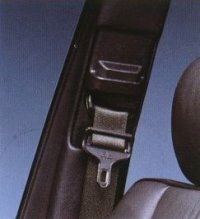 The seat belt height adjustment at the front and the belt buckles in the rear are now even more convenient to use. Pockets on the backrests of the front seats create more stowage space. Additional noise insulation, partly due to the thicker side windows, makes the interior even quieter. Fine wood trim, new fabrics and patterns for the seat coverings and door linings round off the general ambience. A large number of new details which clearly enhance the quality. Features of particular interest to the driver. The driver´s seat is fully adjustable, including seat height and squab angle (optionally extra, electrically adjustable seat and steering wheel with a memory feature). Seat belt height adjustment, electronically controlled belt tensioners. Recessed panoramic windscreen wiper (clears 86% of the screen). Rearscreen wiper with automatic cut-in in reverse gear. Third sun visor above the rear-view mirror. Both exterior mirrors heated and adjustable from the driver´s seat. Power-assisted steering. Rev counter (optional extra in the 200 T and 200 TD). Headlight warning buzzer. Warning lamps for brake fluid, engine oil, coolant and screenwash fluid levels. Function monitors for all exterior lights and ABS. Brake pad wear indicator. Halogen foglights. Graduated headlamps range adjustment. Driving as a positive experience - conscious pleasure in the dynamism and responsiveness of these cars, starting with the good feeling of always being in full control. The meticulous design of the driver´s area allows you to drive with enjoyment. Relaxed - and therefore safe. All the information-giving instruments are clearly marked and grouped according to their significance. All the controls can be identified instantly, and can be operated smoothly with one hand. Everything helps the driver to act and react quickly and safely. Exemplary design features, right down to the details. For example the hazard warning light switch, which stands out clearly on the centre console. The glove compartment lock, positioned where the driver can reach it easily. The rear screen wiper, which operates automatically when reverse gear is engaged, if the front wiper is on. And, not least of all, all elements are designed to enhance active and passive safety. The dashboard does not project into the interior, for instance, and the pedals pivot away from the danger zone in the event of a collision. To mention but a few points. The unique handling characteristics of the T-series are due to the design of the high-precision suspension, with superbly co-ordinated components. Multi-link independent rear suspension. Shock absorber strut independent front suspension. Accurate power steering system. Servo-assisted dual-circuit braking system, supplemented by ABS. Self-levelling rear-suspension, to keep the car horizontal no matter what the load and to provide an ideal balance between ride comfort, safe road-holding and reassuring stability. Electronically controlled, automatic four-wheel drive for better roadholding in extreme conditions. The wash/wipe system (optionally extra) always ensures full headlamp power. The multilink independent rear suspension. For superb straightline stability, absolute tracking and steering precision. Active safety compromises all the features of a car which help you to master critical situations. That also includes the comfort, to help you stay fit and alert. The ergonomic design of the controls, allowing you to react quickly. The lighting and visibility, giving you the best possible view. In these areas, every Mercedes offers exemplary features. And the passive safety systems are equally as exemplary, so as to give you and your passengers maximum protection from injury if the worst should come to the worst. The passenger compartment will retain its shape to a large extent, even if impact energy is very high. The interior has yielding surfaces throughout. The electronically controlled belt tensioners represent today´s most effective restraint system. In addition, the potential of intelligent electronics is also exploited. ABS (standard), the Airbag, ASD, ASR and 4MATIC provide you with systems which "think" and act independently. They analyse the situation with their responsive sensors, make a decision in keeping with the situation and react within fractions of a second. And do this measureably better than a human being ever could. ASR, acceleration skid control is now available in all six-cylinder, petrol driven models with automatic transmission (optional extra). ASR meters tractive power fully automatically and prevents the driven wheels from spinning or the rear of the car from breaking away due to excessive acceleration. Electronically controlled belt tensioners for both front seats. In the event of an impact the seat belts are pulled taut in a fraction of a second, retaining the driver and front-seat passenger earlier and more securely. Additional safety that comes as standard with Mercedes. One of the results of Mercedes-Benz safety research. In an offset frontal collision - the most common form of accident - a specially designed forked member structure at the front, in the area of the fire wall, helps to retain the shape of the interior to the greatest possible extent. ABS is one of the standard safety features in all models. ASD, automatically locking differential, prevents the driven wheels from spinning on slippery road surfaces (optional extra). Both systems were developed by Mercedes-Benz to the stage where they could be made on a large scale. With the Airbag, Mercedes-Benz have developed a highly efficient protection system that has proved its functional realibility many times over. To the present day, over 500.000 Airbags have been fitted. The driver´s Airbag is in the steering wheel, the front passenger´s Airbag where the glove compartment usually is. Some of the main safety features: - High-strength passenger compartment - survival space remains largely intact even in the event of a roll-over, lateral impact or asymmetrical front-end collision. Door locks which neither bursts open nor jam. Front and roof sections yielding and smooth-surfaced so as to lessen the risk of injury to cyclists, motor-cyclists and pedestrians. Steering system with several safety features, including impact absorber, padded boss and deforming corrugated tube, and designed so that movement back into the passenger compartment is minimised. Electronically controlled belt tensioners. Pedals pivot upwards and forwards in the event of an impact. Dashboard padded, yields on impact, deforming to a largely predetermined pattern. Glove compartment deforms in stages. Door linings energy-absorbing, especially at hip level. Even the armrests incorporate deformable, yielding elements. Airbags for driver and front-seat passenger available as optional extras. The Mercedes diesel. A matter personal conviction. Diesel technology has been a domaine of Mercedes-Benz since 1936. Our most recent contribution has been the advanced environmental technology in our "Diesel ´89" programme. At the beginning of 1989, by means of comprehensive engine modifications, we succeeded in reducing our already low particulate emissions by an average of 40%. Permanently and under all operating conditions. This means that Mercedes diesel cars, which have always been exemplary in terms of gaseous emissions, are now comparable, in environmental terms, with petrol-engined cars fitted with catalytic converters. And there are further advantages for the motorist, too. Above all, their overall economy, due to low fuel consumption and the natural robustness and durability of diesels. But also dynamic performance and a standard of refinement - not least due to the engine encapsulation - which combine to make driving these cars an exciting experience. An efficient, competitive propulsion system which will continue to retain its attraction in the future. With the four-cylinder model, driving not only becomes particulary economical; both in town and on the motorway you can experience a powerful, flexible engine which, in terms of noise, is scarcely recognisable as a diesel. The main reason for this are the design qualities, which lift Mercedes diesels out of the category of normal diesel cars. Dynamic starting characteristics and quiet, smooth running, due to the quick-glowing system, fuel pre-warming and automatic idle speed increase at temperatures under 20o C. The new after-glow device - part of the Diesel ´89 package - also improves the engine characteristics after a cold start. Greater everyday practicality and less maintenance, due to self-adjusting, maintenance-free single-belt drive for all auxiliaries. Maintenance-free hydraulic valve clearance compensation. Impressible low noise levels, due to the full encapsulation of the engine compartment and comprehensive insulation between it and the passenger compartment. The engine and gearbox are sealed off by means of sound-absorbing plastic panels all round; this also helps to keep dirt out. The radiator and headlamp surrounds are also sealed. Exemplary environmental qualities due to the Diesel ´89 programme. A newly designed pre-combustion chamber, oblique fuel injection and a number of further detail changes make the combustion process even more efficient, resulting in lower emissions and more effective development of power. It also makes for another slight rise in engine output and a reduction in fuel consumption. The new after-glow device ensures that the system works optimally during the warm-up phase. At higher altitudes, where the air is thinner, the altitude compensation device adapts the fuel injection to the different requirements. The 200 TD. Five-speed manual gearbox as standard (four-speed automatic transmission optionally extra). Optimised gear ratios for considerably improved acceleration. The 2.5-litre engine, justifiably known as a "whispering diesel", offers vibration-free, smooth refinement coupled with responsiveness and performance within a generously sized car. At the same time, it exhibits the typical diesel virtues of low fuel consumption and exceptional robustness. The 250 TD. Five-cylinder in-line engine with environment-friendly Diesel ´89 engineering. Quick-glow system. Fuel pre-warming. Automatically stabilised idling speed; hydraulic valve clearance compensation; maintenance-free drive for all auxiliaries via a single, self-adjusting poly-V-belt. Fitted as standard with rev-counter, five-speed manual gearbox (four-speed automatic optionally extra). As part of the latest improvements, optimised gear ratios and further improved refinement due to a two-mass flywheel (in conjunction with manual gearbox) and larger-diameter rear axle shafts. The Mercedes-Benz pre-chamber combustion system. Compared with other systems, this offers advantages due to smoother, quieter combustion, greater durability and better cold-starting properties. It burns fuel more efficiently and thus helps reduce pollutant emissions and develop more power. The top models, for performance-minded diesel drivers. High-powered, instantly responsive six-cylinder engines, reticent only when it comes to fuel consumption. The turbo models; the fastest and most powerful diesel cars in the world. The 4MATIC model, with electronically controlled automatic four-wheel drive. All the six-cylinder models have permanent, electronically controlled adjustment of idling speed, to the operating conditions applying at the moment. Fuel prewarming. Diesel ´89 environmental technology. Rev counter and central locking as standard. Characteristic features: newly matched five-speed manual gearbox in the 300 TD (four-speed automatic as optional extra). Four-speed torque-converter automatic transmission in the 300 TD TURBO and 300 TD TURBO 4MATIC. Some of the characteristics of Mercedes-Benz turbo engineering: - An outwardly visible sign is provided by the grille in the front righthand wing panel. A distinctive design feature with a functional purpose; it is here that fresh air is drawn in, for optimum turbocharging. The turbocharger gives these engines their impressive output characteristics, allowing more air into the cylinders. The result - the engine develops more power and torque increases considerably. Combined with the natural advantages of the pre-chamber combustion system, this has a positive effect on pollutant and noise emissions, cold starting and fuel consumption. Specially reinforced engine components and a modified cooling system make these engines exceptionally robust. Accurate matching with the four-speed torque-converter automatic transmission converts the high torque into smoothly flowing power. A choice of power output, in keeping with the times. Each individual model offers the versatility required to an increasing extent by critical motorists, by today´s traffic conditions and our environment. At Mercedes-Benz, this versatility has long been available, as a matter of course. Driving characteristics to suit both the stop-and-go of city traffic, and long distances, which can be covered at high average speeds. Refinement that makes every minute of driving a relaxed pleasure. Powerful engines that use their fuel efficiently and therefore operate economically. And, moreover, stressrelief for the environment is built-in. Since autumn 1986, all petrol-driven Mercedes-Benz cars sold in Germany have been supplied with a three-way, closed-loop catalytic converter with an oxygen sensor. New to the range: the top model, 300 TE-24. So now you have a choice of six different engines to choose from, to suit your individual taste. Three matured four-cylinder engines with different power ratings but with common design features to produce powerful, smooth, fuel-efficient charateristics with excellent torque properties. Their high flexibility reduces the number of gear changes and ensures more ride comfort, despite continuously changing traffic situations. Features of the engine-design: - Weight-optimised in-line engines with a high proportion of light-alloy components. Low-vibration, smooth running due to a superbly balanced crankshaft and hydraulically damped engine mountings. Maintenance-free single-belt drive for all auxiliaries. Maintenance-free hydraulic valve clearance compensation. The highly efficient mechanical components are complemented by matured electronics with a precise fine-tuning function. Microprocessor-controlled ignition in all models. Fuel cut-off on the overrun. The 200 T. Two-litre carburettorengine with elecontrically controlled carburettor. Manual four-speed gearbox as standard (five-speed manual or four-speed automatic with two selector programmes available as an optional extra). The 200 TE/230 TE. 2.0 and 2.3-litre engines, respectively, with a mechanical injection system overlaid with electronics governing warm-up, acceleration and full-load enrichment. Manual four-speed gearbox as standard (five-speed manual or four-speed automatic with two selector programmes available as an optional extra). 230 TE with a manual gearbox is additionally fitted with a newly harmonised drive train. Two-mass flywheel and larger-diameter rear axle shafts. These high-performance models offer six-cylinder refinement of the highest order, experienced by the driver as sporty dynamism, silky smoothness and a restrained engine note. The 300 TE 4MATIC, with electronically controlled automatic four-wheel drive for specific requirements. The 300 TE. Six-cylinder in-line engine with a cubic capacity of three litres. Mechanical/electronic injection system. Electronically controlled idling speed. Microprocessor-controlled ignition. Fuel cut-off on the overrun. Central locking standard. Five-speed manual gearbox with two-mass flywheel; optimised axle and gear ratios; integrated drive train with larger-diameter axle shafts. (Four-speed automatic with two selector programmes as an optional extra). The 300 TE 4MATIC. Engine and gear ratios as in the 300 TE. In addition, electronically controlled, automatic four-wheel drive with two differential locks (ABS integrated). 4MATIC. With this system you can keep going, even when the others have come to a halt. On slippery surfaces, even with uneven grip, on uphill stretches and in corners, optimum traction is always available to you and and road-holding is retained. Intelligent electronics act precisely and reliably, engaging front-wheel drive in a fraction of a second and distributing engine power to all four wheels. Whenever you set off from a standstill and whenever the tractive power of only one pair of wheels is not enough or if one of the wheels shows a tendency to spin. The driver is prevented from reacting incorrectly. A warning display tells the driver that the system has cut in and thereby lets him or her know that the condition of the road surface is critical. All in all, 4MATIC represents an enormous gain in safety, especially when towing a trailer. The impressive new six-cylinder engine shows what four-valve technology can really do. With innovative engineering from Mercedes-Benz, its potential is exploited to the full. The electronically controlled adjustment of the inlet camshaft is an essential factor, contributing towards the high output and the huge torque available over the entire engine speed range. Electronically controlled adjustment of the inlet camshaft makes it possible to vary the valve timing to suit engine speed and load. This means that optimum cylinder charging is achieved in all engine speed ranges. The driver experiences the high torque as power in reserve, providing enormous acceleration in every driving situation - especially where it is a question of mastering critical situations rapidly. Other newly developed features of this engine include adaptive anti-knock control, which adjusts automatically to fuels of different quality, the even more precise ignition systems and the two-mass flywheel (in conjunction with the manual gearbox), which reduces vibration in the drive train. Superb "side effects" of this innovative engine design are its silky smoothness, more stable idling, improved economy and a further reduction in pollutant emissions. You can now drive a sports version of the estates. With professional engineering straight from the factory, you can experience the performance of your chosen model more positively and more directly. An exciting new aspect to motoring pleasure - backed by Mercedes-Benz strict standards in engineering and safety. Exclusive sports details round off the Sportline versions, in both the power train and the interior. New Sportline versions are available for all the models except those with 4MATIC. The main running gear modifications are the 20% harder springs and dampers and more direct steering. The bodywork has been lowered by about 32 mm; together with the wide tyres, this ensures even better handling if you adopt a more sporty driving style, and gives the Sportline models their dynamic appearance. An exclusive, sporty atmosphere inside, too. Sports seats at the front, ergonomically matched to the handling characteristics. The pronounced lateral contouring provides secure support while retaining full freedom of movement. The folding rear seat forms a single, three-seater unit. The high-quality seat coverings have a new chequered pattern (leather available as optional extra) and are also available for the optional third row of seats in the rear. The steering wheel and gear lever, trimmed in hand-stitched, black nappa leather, round off this individualistic ambience. Every Mercedes is brilliantly protected. Choosing a colour is a very personal matter. For that reason, Mercedes-Benz offer a wide choice of paint colours - 10 standard and 13 metallic. Yet paint is primarily visible corrosion-protection. To ensure that the pleasure you take in your car remains undiminished for a long time, the paintwork on a Mercedes consists of severel layers, each with a different protective function. In this way, the paintwork adds the final, shining touch to a comprehensive corrosion-protection system which starts at the design stage and gives every Mercedes an above-average lifespan. Mercedes customers profit from this, though, to the point when they resell their cars. Independent experts have repeatedly acknowledged the high quality that a Mercedes retains, even after many years. Quality assurance is detailed precision work - for Mercedes, this begins with basic research and the selection of materials. For constant monitoring and checking of quality, we employ experienced technicians and highly skilled experts, who use the latest computer-controlled aids and take responsibility for the quality of every single car. Thoroughness, care and our own strict quality criteria result in the familiar value retention of a Mercedes. These are the main features of our comprehensive corrosion protection. It starts when the shape of the body panels is being designed. Smooth surfaces, optimum conduction of moisture and body components with a millimetrically accurate fit. Wherever there is a danger of rusting, electrolytically galvanised steel is used. Full galvanisation is not necessarily a good idea, since it increases the car´s weight - and therefore fuel consumption - and wastes raw materials. The smooth underside of the car is given a stone-chip-resistant PVT-coating. The wheel arches are lined with plastic panels, as further protection against stone chippings. All cavities in the bodywork are sealed with a special viscous wax, electronically distributed and metered. All components exposed to damp, salt or gravel, such as the engine and the gearbox, are given a tough coating. All welds and joints are protected by special plastics. After phosphating of the sheet metal surfaces, the multi-layer paintwork begins with cathodic dip priming. This makes it possible to use highly resistant resins and ensures that every welding seam and every bore hole is treated. In addition, every Mercedes is designed, right from the development stage, in such a way that body repairs can be carried out without any problem and at reasonable cost. The newly designed seats in the T-model now offer even more comfort; this becomes particulary and pleasantly noticeable on long journeys. With firmer spring cores and improved foam elements and backrest frames, the spinal column and the back muscles are now even more effectively protected from stress, tension is prevented and vibrations damped. Due to the more pronounced contouring, lateral support is now even better. The front seats can be adjusted individually, while the driver´s seat is also adjustable for height and seat cushion angle. The high-quality, "breathing" seat coverings with new patterns (including a sporty chequered design) can be suited to the exterior colour according to taste. Velours, MB-Tex and soft leather upholstery are also available. All in all, just right for you. The optionally available third row of seats in the rear can have all the same patterns and seat cover variations as the other seats. All in all, just the right seating comfort for you. Sutiting your Mercedes estate to your personal taste. There is scarcely any other car of which such varied demands are made in terms of motoring pleasure and practicality. The concept of individuality behind the estate takes these demands into account when it comes to equipment. The car has everything that is really necessary as standard. Beyond that, an abundant range of optional features is available to fulfill the driver´s own ideas and wishes. Whether you like a particulary dynamic driving style, often have to drive long distances, mainly drive alone or with passengers or use your car for towing, you can put yourself together your own automotive package to accompany you for work, leisure and sport. Along with the new models and features now introduced, the range of optional extras has also been expanded. ASR, the acceleration skid control system, is now available for all six-cylinder petrol-driven models (in combination with automatic transmission). The components within the Sportline package can also be specified singly or combined with one another - e.g. sports seats at the front; sports suspension; smaller sports steering wheel; new chequered sports pattern also for the standard, newly designed seats. The new, extended, central locking system. If you order both central locking and electric windows and/or the tilting/sliding sunroof, the windows and roof close automatically when the car is locked, if the key is held in a certain position. A selection of further possibilities. Automatic climate control; tinted windows; auxiliary heating; heated seats; external temperature display. Heating for the rear of the interior and the additional seats. Entry lights on the doors; seat adjustment with a memory feature. For towing trailers. Trailer copling with removable ball-neck, the fixture being concealed by a special panel when not in use. Roof-rack system for luggage, skis, surfboards, boats and bicycles. These and many other developments have been specially developed for Mercedes and perfectly integrated, ex-factory. They are subjected to the same quality criteria and controls as the cars themselves. One important point: the necessary bore holes and brackets are incorporated before painting, so they are protected from corrosion right from the outset. A special brochure provides a comprehensive summary of all the optional extras. Shock absorber strut independent front suspension with wishbones and anti-dive control; two coil springs; anti-roll bar; two gas-filled spring struts; negative offset steering. Self-levelling multi-link independent rear suspension with five links per wheel; two coil springs; anti-roll bar; two gas-filled shock absorbers; anti-squat and anti-lift control. Optionally extra: electronic automatic locking differential (ASD, already integrated in 4MATIC models); acceleration skid control (ASR) for all six-cylinder petrol-driven models (except 4MATIC). Dual-circuit servo braking system with vacuum-type booster and anti-lock system; floating-calipter disc brakes at the front (internally ventilated on the petrol-driven models), fixed-calipter disc brakes at the rear; mechanical foot-operated parking brake, acting on rear wheels; monitor lamps for brake fluid level of both brake circuits and for ABS; brake pad wear indicator for front brakes. Mercedes-Benz power-assisted steering damper; large, padded steering wheel boss; deformable impact absorber under the padded boss; deformable steering column; steering gear located behind front suspension assembly. Optional extra: electric fore-and-aft steering column adjustment. All-steel monocoque body; rigid, torsion-resistant passenger compartment (safety cell); energy-absorbing front and rear sections; excellent all-round visibility; safety glass windows; five doors, tailgate with two gas-filled springs built into roof; smooth side mouldings to prevent minor bodywork damage; flexible plastic bumpers front and rear; roof rails for attaching further roofrack systems. Optional extra: electric tilting/sliding sunroof. Anatomically contoured, anti-submarining wedge shape, pronounced lateral elements; seat springing adjusted to vehicle springing and seat position; front seats adjustable fore-and-aft and for backreast angle; driver´s seat additionally adjustable for height and squab angle; securely anchored; height-adjustable three-point inertiareel seat belts with belt tentioners and front head restraints adjustable for height via a handwheel; three head restraints on rear seat; rear seats fitted with two interitia-reel seat belts, lap belt in centre; rear seat divided (left 2/3, right 1/3), can be folded down; rear seat squabs with quick-release devices for easy removal. 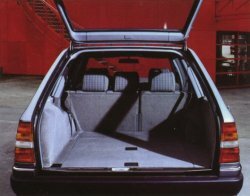 Optional extra: third row of seats (with intertia-reel seat belts) facing the rear, can be fully recessed into luggage compartment floor. Continuous, draught-free flow of warm or cool air; electronic temperature control heats interior to a constant, pre-set temperature between 16 o and 32 oC; air supply to windscreen, side windows and front footwells, separate supply at floor level in rear; heating separately controlled for left and right sides of car; large fresh-air vent in the centre of the dashboard, fully adjustable for direction; heated rear screen with automatic cut-out; four-stage radial fan with cut-off flap. Optionally extra: air coniditioning or automatic climate control; floor level heating. Safetly glass windows all round; windscreen laminated; heated screenwash system with two heated twin nozzles; panoramic windscreen wiper with eccentric sweep; two speeds and intermittent control, operated by the combination switch on the steering column; rear screen wiper with wash/wipe combination, operated via rocker switch on centre console and automatically; heated rear screen. Rectangular halogen headlights with slide lights, asymmetrical low beams, high beams, fog lights; warning buzzer when side lights or headlights not switched off; pneumatic headlamp range adjustment; parking lights; tail lights; brake lights; reversing light; rear fog lamp; number plate lights; variable instrument illumination; passenger compartment light with delay switch and additional reading lamp for front passenger; rear courtesy lights, illuminated ashtray, glove compartment, heating and ventilation controls; illuminated symbols around rotary light switch; flashing "fasten seat belt" sign. Self-cancelling indicators, finger-tip contact for overtaking, operated by combination switch on steering column; horn; headlamp flasher; hazard warning lights. Wedge-pin door locks on all side doors; child-proof locks on rear doors; safety lock on tailgate with electro-mechanical closing aid, child proof; steering wheel lock combined with starter (in diesels: pre-glow starting system) and starter non-repeat unit; four-way master key for doors, steering wheel lock, glove compartment. Second key for doors and steering wheel lock. Optional extra: dual-pressure central locking (standard on all six-cylinder models). Instrument panel added, yields on impact, speedometer; rev counter (optional extra in the 200 T/200 TD); oil pressure gauge; fuel gauge; fue consumption trend indicator in petrol-driven models; coolant temperature gauge; monitor lamps for parking brake, battery charging current, direction indicators, high beam, rear fog lamp and fuel reserve; brake pad wear indicator; quartz clock; mileage recorder; trip recorder; warning light for engine oil, brake fluid, coolant and screenwash fluid levels; bulb failure indicator for all exterior lights; monitor lamp for ABS. Pre-glow monitor lamp for diesels. Centre console, dashboard and door linings with fine wood trim; oddments tray between the front seats; pockets on the front doors and front seat backrests; lockable glove compartment with damper element; rear-view mirror adjustable to anti-dazzle position; both exterior mirrors heated and adjustable from inside (on the nearside electrically), low-dazzle glass; three padded sun visors, with metal safety mirror on front passenger´s side; three grab handles on the roof frame; clothes hooks on the grab handles in the rear; armrests with grab handles on the doors, padded; ashtray with cigarette lighter in the front; ashtrays in rear doors; fine velours carpeting front and rear; oddments compartment in recess beneath luggage compartment floor; towing lugs front and rear; warning triangle; first-aid kit in parcel shelf; fuel tank capacity approx. 72 litres. 1. Engagement of front-wheel drive, power distributed 35% to front, 65% to rear. 3. 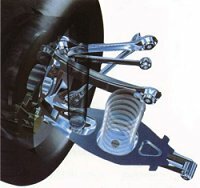 Engagement of rear-axle differential lock between rear wheels. Function monitor lamp in instrument panel. The engine and transmission areas are sealed off from the outside by encapsulation elements attached to the body. The bonnet and transmission tunnel are lined with insulating matting. The bonnet and headlamp surrounds are additionally sealed by sectional rubber elements which help to keep out dirt and reduce noise from the engine compartment.